Birth card of Anton Ludwik, showing that a midwife, Helene Weiss, helped his mother Minnie deliver. Courtesy of the University of Cincinnati Libraries. For a long time, I've been fascinated with the history of childbirth and midwifery, especially around the turn of the 20th century when a lot of medical norms were changing. This post looks at this time period, examining old obstetric and public health records, to better understand how midwives in Cincinnati (many of them immigrants) and some of our earliest obstetricians experienced these years. European immigrants in Cincinnati tended to use midwives and almost exclusively had home births up through the early 1900s. Obstetricians (OBs) in Cincinnati in these years, then, had to convince German and other immigrant women to let them direct the delivery process. Not an easy task. The field of OB/GYN medicine was one of the last to professionalize due to the power that midwives had and that many doctors had a hard time getting clinical training in the field (for propriety's sake, among other reasons). But historians have traced that across America, up through the 1920s and ‘30s, OB/GYN physicians finally (slowly) pushed midwives out of business (basically everywhere other than the deep south where Black midwives still attended Black women). I wanted to investigate this process and relationship more, here in Cincinnati – how did obstetricians interact with midwives? How did OBs view pregnant immigrants and their infants? How were these women convinced to use (male) OBs in hospitals over (female) midwives at home? 1880 city directory showing midwives. Courtesy of the Public Library of Cincinnati and Hamiton County. I found two chronological developments. First, local OBs tried to get a foothold in the business by merely regulating midwives more, trying to bring midwives up to medicine's professionalizing standards in the early 1900s. But … soon enough, these men, with the support of a public health movement and social welfare organizations, got more involved. In fact, they created for themselves a special “gatekeeping” role: that of regulating the childbirth of immigrant infants. Obstetricians began to argue that only they could correctly deliver an immigrant baby, only they could initiate immigrant infants into America, only they could help Americanize (in many ways, whiten) these children. Cincinnati has a really neat medical history. As a pioneering city in medical education, it had one of the nation’s first medical schools, the Medical College of Ohio, opened in 1819 under Dr. Daniel Drake. Cincinnati also boasted nationally prominent obstetricians and gynecologists as well as founding members of national obstetrical, gynecological and medical societies. The turn of the century also witnessed the greatest influx of immigrants into the U.S. Economic and political dislocations pushed millions here. Between 1880 and 1924, 23.5 million immigrants arrived in the U.S., largely from central, southern and eastern Europe but also in smaller numbers from Asia, Mexico and Canada. This mass “invasion” of immigrants was not wholly welcomed. While episodes and waves of nativism affected earlier immigrations, there was a distinct shift in the Progressive Era in how some expressed "we don't want you here." It had to do with who was considered white. A booming industrial Cincinnati in 1909. Courtesy of Shorpy.com. There have always been ideas of whiteness and race in America (and they’ve always been tied to citizenship – the whiter, the better), but by the Progressive Era, they got more “scientific.” Race became a spectrum of carefully delineated human types, ranked by degree of whiteness. Nordic people and Anglo-Saxons from places like England were whitest; the new immigrants of the Slavic, Greek, Italian, Hungarian and Jewish origins were considered less white and even dangerous. People from India ranked lower; people from Africa were below that; persons of mixed racial backgrounds were at the bottom of this racial totem pole. 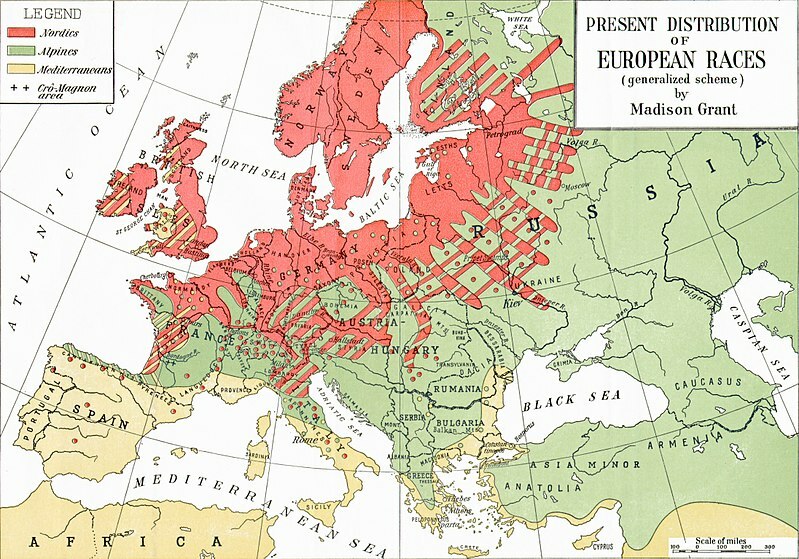 From Madison Grant's The Passing of the Great Race, showing a map of races in Europe in the early 1900s. Courtesy of Wikipedia.com. Eugenicists like Grant encouraged the "fit"—meaning the white middle and upper classes—to reproduce and counter their declining fertility rates while discouraging the "unfit"—these “mentally crippled” immigrants—from having more children. Hyperbolic expressions of white middle-class "race suicide" circulated: the average (white) American family produced only three children in 1900 in contrast to six in 1840, whereas new immigrant women of central, southern and eastern Europe were increasingly under fire for their high fertility rates. On average, almost twice as many children were born to these foreign-born women as to native-born women. 1900 city directory, showing a growing number of midwives compared to earlier years. Courtesy of the Public Library of Cincinnati and Hamilton County. This was an era in which many people were worried about immigrant health in general—not just maternal and prenatal issues. Newcomers were thoroughly inspected at Ellis Island and other ports for fears they carried contagious diseases. Physician inspectors assessed immigrants’ physical and mental fitness, and then either admitted or rejected them based on medical opinion. Since the mid-1800s, OBs gradually had been putting midwives out of work—but it was slow work. Women of means were some of the first to permit these male doctors into a very intimate female experience, mostly because physicians said they could guarantee a better outcome than a midwife for the woman and her child. Doctors usually argued that they had better training and tools (like forceps and later anesthesia) compared to midwives. The trick, then, was to also get immigrant working-class women to let OBs into their labor and deliveries. It seems that in Cincinnati, plan A was to work with the midwives. For much of human history and up to the late 1800s in America, a professional career in medicine had no fixed pattern or course. Medical school was not a requirement. Apprenticeships had no standardization. General physicians proliferated. Between 1850 and 1930, however, the profession became more cohesive. Medical schools were more common, yet with easy standards they produced too many graduates. So, med school became more rigorous. It made secondary education a prerequisite, and students had to undergo clinical training as a mandated requirement for the degree. Internships and residencies became included. Laboratory courses in the medical sciences of physiology, bacteriology and biochemistry were slowly incorporated into the curriculum. Specialty boards created around World War I began to evaluate physicians’ competence. The early founding of the American Medical Association (AMA) in 1847 was largely a reaction to the extreme proliferation of (not-so-well-trained) physicians. The AMA and other medical societies lobbied for the state licensing of physicians so that by 1900 the majority of states had licensing laws that required you to have a degree from an approved medical school in order to practice medicine. In 1904, the Council of Medical Education set up by the AMA created standards for and interrogated the level of education in U.S. medical schools. Armed with negative results, the AMA closed many schools down. The damning 1910 Flexner Report demanded U.S. medical schools improve. Emulating the John Hopkins Medical School, medical schools began to train graduates in specialties through postgraduate training. Serving as assistants to professors, the postgraduates would gain experience in one specialty through clinical work in hospitals attached to or associated with the university or medical school. But—even into the first decades of the 20th century, obstetrics was one specialty that did not move to the hospital for postgraduate, clinical assistantship training. Issues of propriety prevented medical students from gaining clinical experience. Furthermore, the claim by OBs that they could offer women safer births in hospitals rang hollow: infant and maternal mortality rates remained high in hospitals in these years (often doctors just didn’t wash their hands…). The problems of OB legitimacy manifested nationally, and locally in the Cincinnati Obstetrical and Gynecological Society, founded in 1876 as the fourth national obstetrical society. It had severe membership problems through the Progressive years. Nationally, not until 1930 was the American Board of Obstetrics and Gynecology formed. The American College of Obstetricians and Gynecologists (ACOG) was not founded until 1951. While most clinical areas of medical school training had moved to the hospital by the 1920s, the teaching of obstetrics failed to do so. Most OBs, in this crisis, argued that midwives and general practitioners obscured the importance of the OB specialist. To try to fix this issue, and as a way to insert themselves into women's childbirths (especially immigrant mothers who insisted on using midwives), OBs first tried to regulate—not eradicate—midwifery among immigrant women. Thaddeus Reamy. Courtesy of GenealogyBug.net. Blaming midwives for high infant mortality rates, Reamy and the Cincinnati medical community decided it was worth the effort to try and formally educate and certify local midwives (other physicians in Ohio were also talking about instituting new licensing requirements for midwives as a way to regulate them). He cited that over 5000 of the 8000 births reported last year in Cincinnati were reported by midwives, and he placed blame on the midwives for high maternal and infant mortality rates. Speaking specifically about Germans in Cincinnati, he was struck by “the large number who reported that the maternal parent had died in child-birth, or from some disease connected with parturition.” He continued, “Upon pushing my inquiries still further I learned that in almost every such instance the deceased had been attended in confinement by a midwife.” Reamy and his colleagues argued that few of these midwives “have any proof to offer that they ever attended upon a systematic course of instruction, or passed a proper examination before any competent board, or by the authority of any college, home or foreign.”. In France no midwife is allowed to practice until she has passed the prescribed examination. Those who graduate in a faculty of medicine can practice all over France, while those who graduate in a provincial school can practice only in the provinces. In Russia a midwife is required to study three years, and pass a successful examination. But in Cincinnati, where 70 per cent. of deliveries are made by midwives, they are not even required to be able to read or write. Reamy saw midwives—if trained in medical schools—as potential allies against “the impositions of ignorant or fraudulent pretenders to medical knowledge.” He equated ignorant midwifes to abortionists and charlatans. Importantly, it wasn’t just midwives that Reamy wanted to control. To him, an indicator that Cincinnati was on the up-and-up was the apparent increase in the number of medical schools and the decrease in the number of “homeopaths” in the city. He often contrasted Cincinnati with Europe, which he admired for its stricter medical licensing laws and educational curriculum. He even acknowledged that Cincinnati’s midwives who had European training were well-educated. This attitude of compromise soon ended. As the numbers of immigrants continued to rise in the first decades of the 20th century, immigrant women and their high fertility rates became more controversial and important to control and monitor. OBs here in Cincinnati began to assert that only they—white, formally trained men—could squeeze out the midwives attending these immigrant women, and only they could successfully deliver these American-born babies. In contrast to earlier praise for European medicine, Cincinnati physicians began to argue that foreign medical practitioners in the U.S. were no longer qualified by non-U.S. certifications. Foreigners now had to pass U.S. medical examinations and boards and illustrate fluency in the English language. The U.S. did not want “itinerant frauds and medical tramps” practicing. In 1899, in the popular medical journal, the Lancet-Clinic, the article “Physicians and Education” likened doctor to parents. Just as a parent guided his child’s development, the doctor guided the nation’s development: “the desires of the parent and the State are identical: both want strong, healthy, and subsequent intelligent, adult citizens.” It was the physician’s job to promote and guide the mentally, morally and physically strong citizens that the state needed. Self-styled as shepherds of U.S. health, physicians maintained that the difference between themselves and quacks was that quacks did not serve the nation. The difference between obstetricians and midwives was that midwives did not serve the nation. Suddenly, even licensed, registered midwives were no longer acceptable. Midwifery in Ohio was not legally defined or permitted but it was also not prohibited; physicians sought to change this. On the one hand, this wasn’t new. Medical professionals here and elsewhere had long worried about immigrant health contaminating the nation. But—what was new was the insertion by men like Reamy into the intimate childbirths of immigrant women, all because, “It is recognized that it is a pretty good thing to have the children of the Nation well born.” For immigrant babies who were seen as potentially dangerous/at risk (remember: eugenics prescribed many of these people as "undesirable"), OBs maintained that good obstetric work started at birth and concluded only when the infant successfully grew into childhood. It was the doctor “alone who can and does realize the physical and moral requirements of the people among whom he makes his daily rounds;” he alone knows the “toils, trials, and skimping” in lower-class and immigrant households. This OB health crusade gained tactical support and legitimacy through Cincinnati’s public health movement. Armed with the new knowledge of bacteriology and pathology, public health campaigners here and elsewhere encouraged people to view epidemic disease and sickness as the consequence of unhealthy but correctable personal habits and inadequate public health infrastructure. These health reforms emphasized personal hygiene, exercise, good diet, sexual purity, physical, mental, and moral fitness and the orthodoxy of the physician. With public health workers and social welfare organizations, every state also supported a board of health by the first decades of the 20th century whose job was to monitor and protect the public’s health. A major aspect of public health in the Progressive Era was the reduction of infant mortality. Reformers worked on things like improving the urban milk supply, especially for lower-class and immigrant women, and sought to educate mothers on the importance of prenatal and postnatal health. In Cincinnati, the Health Department saw, for a time, midwives and physicians both helping with this task. But then things changed. Prior to 1909, Cincinnati’s Health Department made no distinction between the work of midwives and physicians; the department reported both groups’ activities equally, and in many cases, criticized physicians for being less dutiful in reporting childbirth cases to the department than midwives. Revealing the prevalence and importance of these women workers, the Department, in their 1897 annual report, pled midwives and nurses to be on guard for warning signs of infant blindness. Not until 1905 did physicians surpass midwives in the number of childbirth cases attended, and by 1909, the Department began to report how amenable physicians were, in contrast to midwives, at regularly reporting childbirth cases to the Department. By 1913, midwives’ efforts failed to appear in the Department’s records; it also announced that women had to deliver at either a maternity society or a hospital, under a physician. It seems Cincinnati public health officials mimicked OBs in their increasingly rigid definition of who was a qualified health practitioner. In negative ways, the Health Department began assessing midwives. In the 1911 annual report, it evaluated the personal and professional nature of midwives. The women, mostly from Germany but also Austria-Hungary, Russia, England, Italy, Romania and the U.S., were classified by their length of residency in the U.S. as well as their education and their possession of a foreign or “worthless” U.S. diploma. The annual report defined the midwife’s education solely by her ability to speak and read in English. The assessment also examined the midwives’ “conditions of home and person,” ranking them as “fair or good,” or “bad.” Seems like it no longer mattered to Cincinnatians if the women were skilled. That they were not native, not men and not accredited all meant they were suspicious. Also illustrating a heightened focus on infant health, disparate charities in Cincinnati formed an umbrella organization in 1911 called the Conference of Charities and Philanthropies, later renamed the Community Chest, to promote efficiency and cooperation among charitable and benevolent institutions. In January 1918, the Chest helped to unite 67 different health organizations under the Public Health Federation. Together, the Federation and the Chest threw their support behind the Babies’ Milk Fund Association and the Pediatrics Department of UC’s College of Medicine as hopeful panaceas to infant mortality. On the one hand, this was pragmatic. On the other, it was a part of the conversation surrounding citizenship and physical health in the Progressive Era. One Chest pamphlet, “Social Engineering in Cincinnati,” argued in light of the U.S. entering World War I, it was of utmost importance that the nation had sound minds in sound bodies. The mental and physical fitness and health of the nation would guarantee the nation’s greatness. Specifically, every newborn baby had to be born healthy. He was the carrier of national greatness, and physicians were the social and medical engineers of American society, helping to safeguard the newborn into the world. This interest in physical fitness is apparent in the Better Babies Contests. In order to encourage a reduction in urban infant mortality—mostly an issue among immigrant and lower-class women—public health officials here and elsewhere would hold competitions in which babies would be entered and judged on physical wellness. But really, it was the mothers who were being judged. These competitions were meant to encourage working-class mothers to strive for plump, rosy-cheeked babies. The winner received a gold medal; those who were close in the running received diplomas, certifying the mother had performed a job well done. Much like OBs who felt immigrant mothers were ignorant in their childbirth choices, the Better Babies Contests exposed that public health officials felt they needed to instruct immigrant working-class women in proper childrearing. A winner of one of Cincinnati's Better Babies Contests. Courtesy of the Public Library of Cincinnati and Hamilton County. Some social welfare organizations, including the Maternity Society of the Protestant Episcopal Church, the Babies’ Milk Fund Association and the Cincinnati Society for the Welfare of the Blind, also supported the movement away from accommodating immigrant women’s use of midwifery and home birth. One of the Babies' Milk Fund locations at the corner of McMicken and Race Street in Over-the-Rhine. Courtesy of University of Cincinnati Libraries. From its creation, the Maternity Society utilized the services of a doctor and several nurses for pregnant women, but very few immigrant women would accept the services of a doctor when the Society was first founded: “. . . there was at that time not more than one in three of our beneficiaries who would send for a doctor at all, a less proportion that would have a man attend them.” So, initially, the Society only employed female doctors. It reported, “In the first six months of the year, we had only women doctors—Drs. Prior, Southgate, Hauser, and Hutchinson.”. The Maternity Society began to work closely with the Babies’ Milk Fund Association during World War I when the Society started using the milk stations for prenatal clinics and contracting its nurses from the Association. The Association was the creation of pediatrician Dr. Benjamin Knox Rachford. In 1907, Rachford arranged with the City Health Commissioner, Dr. Mark A. Brown, to distribute certified milk to the patients of the Children’s Clinic of the Ohio and Miami Medical schools, which later fused to form the Medical College of the University of Cincinnati. With funding by Mrs. Mary Emory and prominent Cincinnatians, the Association’s operations were under way by 1909. Using this clinic and later expanding to others, the Association operated by pediatricians volunteering their services in the clinic, examining the infants and instructing the mother on how to prepare the milk. Nurses joined the staff, working at the clinic and visiting the homes where they helped mothers with infants and disease prevention. The Association imparted to immigrant mothers the importance of infant hygiene and milk sterilization. Focusing on bathing techniques, methods of boiling bottles and preparing milk formulas, the organization disseminated its advice by group demonstrations and by individual interviews with parents in hospital, home, and clinic. The Society eventually established the University Medical College's first prenatal clinic in August 1916. Before this, home deliveries were still so common that the Society used the Outdoor Obstetrical Department of the University, contracting out the physicians there to attend immigrant women at their own homes. But this accommodation dwindled. The Society stated, “It was inevitable that the delivery of mothers was eventually taken care of in hospitals, and by June of 1932 this was the case. The following year, the Maternity Society equipped a delivery room at the General Hospital, where all clinic cases are referred.” It would eventually withhold the maternity bundle—a package of clothing and food for expecting mothers—until the time of confinement. This forced immigrant women to attend prenatal clinics and establish a relationship with physicians and social workers running the Society. Care was given during the year to 198 mothers in their homes at delivery and for ten days following; 987 mothers attended prenatal clinics. Urinalyses and Wasserman tests are done and blood pressures taken on all cases at prenatal clinics. Nursing follow-up and any other care is arranged for as indicated. The majority of mothers in attendance at prenatal clinics are delivered at the General Hospital. A desire for hospital care is becoming more general among the intelligent mothers, who are learning to value the care and rest which a hospital makes possible for them. The status of midwives has been investigated and of sixty-five, fifteen are practicing without ever having passed a State Board examination, have no license, and are not qualified to do this work. Six midwives have been restrained from practicing, severely lectured, and fined fifty dollars and costs. These disclosures will lead to a higher standard, a better class of women, a lower death rate, and less blindness in new-born infants. Twenty-five per cent. of all blindness in childhood is due to improper care at birth. The Society argued infant blindness was because the expecting women had called the doctor too late and the rushed doctor did not inspect the infant properly, or the attending midwife was incompetent. The “most serious and flagrant case so far brought to our notice” concerned a Hungarian boy brought to the City Hospital. Because “no doctor had been in attendance” and the mother delivered with a midwife, the infant lost one eye. To the Society, blindness robbed one of “[one’s] grip, [one’s] ambition, [one’s] desire to be a useful citizen”—the aim of the Society was thus to make the blind into “progressive citizens.” It seems, to the Society, immigrant mothers and their attending midwives were preventing their infants from becoming productive U.S. citizens. Only with the physician delivering the women’s babies would the infants not become public charges. What this all meant was, like in other cities, a slow phase-out of midwives by discrediting them and taking business from them. Not until the 1970s, with the home birth movement, did some American women begin to reconsider midwifery and home birth. 1920 city directory. Note how many fewer midwives there are, compared to 1880 or 1900. Courtesy of the Public Library of Cincinnati and Hamilton County. According to the 1912 Report on the Survey of the Foreign Population in Cincinnati (courtesy of Public Library of Cincinnati and Hamilton County), in Cincinnati, there were about 90,000 (22.5%) Germans, 50,000 English, Irish, Scotch, Welsh, Canadians (12.5%), 30,000 German, Russian, Polish, Hungarian Jews (7.5%), 10,000 Italians (2.5%), 8000 Romanians (2%), 6000 Hungarians (1.5%), and other nationalities or ethnicities including Belgians, Finns, French, Dutch, Scandinavians, Portuguese Turks, Croatians, Serbians, Macedonians, Bulgarians, Syrians, and Greeks. In terms of its prominent medical history, Cincinnati established the fourth national obstetrical society in 1876. Many of its founders were professors of obstetrics and gynecology as well as founding members of national organizations such the American Gynecological Society and the American Association of Obstetricians, Gynecologists and Abdominal Surgeons. National debates among obstetricians and gynecologists about the use of forceps and anesthesia in childbirth as well as new surgical trends played out in Cincinnati’s Obstetrical and Gynecological Society and in the Academy of Medicine, Cincinnati’s professional association of physicians. For more, see Arthur G. King, The Cincinnati Obstetrical and Gynecological Society, 1876-1976 (Cincinnati: Merrell-National Laboratories, 1976). Paul Starr, The Social Transformation of American Medicine: The Rise of a Sovereign Profession and the Making of a Vast Industry (New York: Basic Books, Inc. 1982), 13-15; see also Ira Rutkow, Seeking the Cure: A History of Medicine in the U.S. (New York: Scribner, 2010). Roger Daniels, Coming to America: A History of Immigration and Ethnicity in American Life (New York: HarperCollins, 2002); Alan M. Kraut, “Silent Travelers: Germs, Genes, and American Efficiency, 1880-1924,” Social Science History, Vol. 12, No. 4 (Winter, 1988): 377-78; John Higham, “American Immigration Policy in Historical Perspective,” Law and Contemporary Problems, Vol. 21, No. 2, Immigration (Spring, 1956): 213-35; John Higham, Strangers in the Land: Patterns of American Nativism, 1860-1925 (New York: Antheneum, 1971); Erika A. Lee, “The Chinese Exclusion Example: Race, Immigration, and American Gatekeeping, 1882-1924,” Journal of American Ethnic History, Vol. 21, No. 3 (Spring, 2002): 36-62; Matthew Frye Jacobson, Whiteness of a Different Color (Cambridge: Harvard University Press, 1999); Ian Haney-Lopez, White by Law: The Legal Construction of Race (New York: New York University Press, 1996, 2006); Mae Ngai, Impossible Subjects: Illegal Aliens and the Making of Modern America, (Princeton: Princeton University Press, 2004). Jacobson, Whiteness of a Different Color, 31-39, 68-74, 78-90. The 1790 Naturalization Act granted the ability to be a U.S. citizen to “free white persons.” After 1870, the phrase “and any person of the African race or of African descent” was added. Madison Grant, The Passing of the Great Race; or, The Racial Basis of European History (New York: Charles Scribner’s Sons, 1916), 80-81. Wendy Kline, Building a Better Race: Gender, Sexuality, and Eugenics from the Turn of the Century to the Baby Boom (Berkeley, Los Angeles and London: University of California Press, 2001), 2-12. The 1900 Immigration Commission’s report on the “Fecundity of Immigrant Women” showed that the new immigrant women less than forty-five years of age and married ten to nineteen years mothered an average of 4.4 children—compared to 2.7 for native-born women. See also Charlotte G. Borst, Catching Babies: The Professionalization of Childbirth, 1870-1920 (Cambridge: Harvard University Press, 1995); Nancy Schrom Dye, “Modern Obstetrics and Working-Class Women: The New York Midwifery Dispensary, 1890-1920,” Journal of Social History, Vol. 20, No. 3 (Spring 1987): 549-64; Michael Marks Davis, Immigrant Health and the Community (New York and London: Harper and Brothers Publishers, 1921), 184, 186, 196-99; Doris Weatherford, Foreign and Female: Immigrant Women in America, 1840-1930 (New York: Facts on File, Inc., 1995), 2-11. Alan M. Kraut, Silent Travelers: Germs, Genes, and the ‘Immigrant Menace’ (Baltimore: The Johns Hopkins University Press, 1994), 2. Kraut states, “Between January 1, 1892, and November 29, 1954, over twelve million immigrants were inspected and interrogated and finally told whether or not they were fit enough for America.” See also Amy L. Fairchild, Science at the Borders: Immigrant Medical Inspection and the Shaping of the Modern Industrial Labor Force (Baltimore: The Johns Hopkins University Press, 2003); Wendy Kline, “Immigration, Medical Regulation, and Eugenics,” in Handbook on American Immigration and Ethnicity (Oxford and London: Oxford University Press, 2014), 1-8. Judith Walzer Leavitt, Brought to Bed: Child-Bearing in America, 1750-1950 (New York and Oxford: Oxford University Press, 1986), 36-63; see also Richard W. Wertz and Dorothy C. Wertz, Lying-In: A History of Childbirth (New Haven and London: Yale University Press, 1977, 1989). They argue that middle- and upper-class women had been attracted to male birth attendants and later hospital birth because of the promise of a safer childbirth and the potential for a less painful experience. By the 1930s, most American women delivered in hospitals. William G. Rothstein, American Medical Schools and the Practice of Medicine: A History (New York and Oxford: Oxford University Press, 1987), 67-149. The Flexner Report was a massive study on the state of medical education in the U.S., undertaken by the Carnegie Foundation for the Advancement of Teaching beginning in 1908. The study was performed by Abraham Flexner, and he found over the course of 1909-10 that U.S. medical schools needed drastic reform. He urged more laboratory training in basic sciences, more clinical training in hospitals and stricter requirements to become enrolled in and later graduate from medical schools. Rutkow, American Medical Schools and the Practice of Medicine, 132-33. Charlotte G. Borst, “Teaching Obstetrics at Home: Medical Schools and Home Delivery Services in the First Half of the Twentieth Century,” Bulletin of the History of Medicine 72.7 (1998): 220-24. King, The Cincinnati Obstetrical and Gynecological Society, 37-38. King, The Cincinnati Obstetrical and Gynecological Society, 61-81; see also Starr, The Social Transformation of American Medicine, 356-57: the AMA and other medical groups created the Advisory Board for Medical Specialties only in 1933 to establish order for specialty divisions. Borst, “Teaching Obstetrics at Home:” 220-23. King, The Cincinnati Obstetrical and Gynecological Society, 9-12. Dr. Thaddeus Reamy was a founding member of the Cincinnati Obstetrical and Gynecological Society, a member and officer of the American Gynecological Society, professor of obstetrics, gynecology and pediatrics at the Medical College of Ohio. He was elected the president of the Academy of Medicine of Cincinnati in 1881; he was known as a fervent proponent of obstetrical clinical training for medical students. “How Shall the Young Physicians Rescue Obstetrics in Cincinnati from the Hands of Midwives,” Gillespie/Reamy Papers, Box No. 3103, R. G. No. 94, RG-146, Henry R. Winkler Center for the History of the Health Professions (hereafter WC), University of Cincinnati, Cincinnati. The issue of midwifery regulation emerged in the Progressive Era; no two states handled midwife regulation in the same manner. In most states, midwives practiced without state interference or control until the 1920s. While many physicians disagreed with such laxity, the Sheppard-Towner Maternity and Infancy Protection Act of 1921 provided funds to several states to institute programs of midwife regulation and education. By 1930, all but ten states required midwives to be registered. Much of the legislation generated at this time reflected the view of the medical establishment which sought to eliminate the midwife. In addition to legal restriction, midwifery use also declined because of American women’s declining fertility, use of hospital birth, the issue of restricted immigration (and thus fewer clientele as immigrant women mostly used midwives) and growing anxiety about dangers of birth, which often meant the use of an obstetrician to potentially guarantee a safer birth. See Raymond G. DeVries, Making Midwives Legal: Childbirth, Medicine, and the Law (Columbus: Ohio State University Press, 1996), 37-38. King, The Cincinnati Obstetrical and Gynecological Society, 26-29. Dr. Joshua W. Underhill was a founder of the Cincinnati Obstetrical and Gynecological Society. He sat on the faculty of the Cincinnati College of Medicine and Surgery, and was a member of the American Gynecological Society. “The Obstetrical Society of Cincinnati (1880) Valedictory Address by the Retiring President, J. W. Underhill, M.D. and Inaugural Address by Thad A. Reamy, M.D., President Elect,” Gillespie/Reamy Papers, Box No. 7-73314, R. G. No. 94, R6-146, WC. “1880 Inaugural Address by Reamy, addressed to the ‘Gentlemen of the Obstetrical Society of Cincinnati,’” Gillespie/Reamy Papers, Box No. 7-73314, R. G. No. 94, R6-146, WC. “How Shall the Young Physicians Rescue Obstetrics in Cincinnati from the Hands of Midwives,” Gillespie/Reamy Papers, Box No. 3103, R. G. No. 94, RG-146, WC. “The Study of Medicine and Women,” Cincinnati Lancet-Clinic, July-Dec. 1879, Vol. 42, Pg. 264, the Public Library of Cincinnati and Hamilton County, Cincinnati. “Prescribing Midwives,” Cincinnati Lancet-Clinic, July-Dec. 1881, Vol. 46, Pg. 22, the Public Library of Cincinnati and Hamilton County, Cincinnati. “Progress in Medical Education in the United States,” Cincinnati Lancet-Clinic, Jan.-June 1888, Vol. 59, Pg. 335, the Public Library of Cincinnati and Hamilton County, Cincinnati. “Medical Colleges and the License to Practice,” Cincinnati Lancet-Clinic, July-Dec. 1888, Vol. 60, Pg. 447, the Public Library of Cincinnati and Hamilton County, Cincinnati. “Foreign Schools Versus American Physicians,” Cincinnati Lancet-Clinic, July-Dec. 1894, Vol. 72, Pg. 536-8, the Public Library of Cincinnati and Hamilton County, Cincinnati. “The Ideal Doctor,” Cincinnati Lancet-Clinic, July-Dec. 1895, Vol. 74, Pg. 65, the Public Library of Cincinnati and Hamilton County, Cincinnati. “Physicians and Education,” Cincinnati Lancet-Clinic, July-Dec. 1899, Vol. 82, Pg. 430-1, the Public Library of Cincinnati and Hamilton County, Cincinnati. “The Quacks,” Cincinnati Lancet-Clinic, July-Dec. 1899, Vol. 82, Pg. 156, the Public Library of Cincinnati and Hamilton County, Cincinnati. “The Physician and the Druggist,” Cincinnati Lancet-Clinic, Jan.-June 1901, Vol. 85, Pg. 219, the Public Library of Cincinnati and Hamilton County, Cincinnati. “Immigration Supervision,” Cincinnati Lancet-Clinic, July-Dec. 1893, Vol. 70, Pg. 186-7, the Public Library of Cincinnati and Hamilton County, Cincinnati. “An Immigrant Inspector for Cincinnati,” Cincinnati Lancet-Clinic, July-Dec. 1893, Vol. 70, Pg. 191-3, the Public Library of Cincinnati and Hamilton County, Cincinnati. “Immigration,” Cincinnati Lancet-Clinic, Jan.-June 1896, Vol. 75, Pg. 524, the Public Library of Cincinnati and Hamilton County, Cincinnati. “The Future Practice of Medicine,” Cincinnati Lancet-Clinic, Jan.-June 1902, Vol. 87, Pg. 7-8, the Public Library of Cincinnati and Hamilton County, Cincinnati. “Sociological Questions,” Cincinnati Lancet-Clinic, Jan.-June 1894, Vol. 71, Pg. 712, the Public Library of Cincinnati and Hamilton County, Cincinnati. King, The Cincinnati Obstetrical and Gynecological Society, 52. Most historians of midwifery and childbirth argue that the reason why physicians and specifically obstetricians began to restrict and attack midwifery was because of professional rivalry. See Raymond G. DeVries, Making Midwives Legal: Childbirth, Medicine, and the Law (Columbus: Ohio State University Press, 1996), 25-26. Robert A. Hahn, “Divisions of Labor: Obstetrician, Woman, and Society in Williams Obstetrics, 1903-1985,” Medical Anthropology Quarterly, New Series, Vol. 1, No. 3, Obstetrics in the United States: Woman, Physician, and Society (Sep. 1987): 262. Jacqueline H. Wolf, “Saving Babies and Mothers: Pioneering Efforts to Decrease Infant and Maternal Mortality,” in Silent Victories: The History and Practice of Public Health in Twentieth-Century America, ed. John W. Ward et al. (Oxford and New York: Oxford University Press, 2007): 135-37. Ruth Clifford Engs, The Progressive Era’s Health Reform Movement: A Historical Dictionary (Westport, CT and London: Praeger Publishers, 2003), x.
 Judith Walzer Leavitt, Typhoid Mary: Captive to the Public’s Health (Boston: Beacon Press, 1996), 23-39. For Progressive Era public health and health reform, see also Nayan Shah, Contagious Divides: Epidemics and Race in San Francisco's Chinatown (Berkeley: University of California Press, 2001); Richard A. Meckel, Save the Babies: American Public Health Reform and the Prevention of Infant Mortality, 1850-1929 (Ann Arbor: University of Michigan Press, 1998). Meckel, Save the Babies, 4-6; 92-100, 159-177. Meckel argues that part of the shift to a focus on maternal reform was a new appreciation among physicians and public health officials of the value of breastfeeding. As immigrant and lower-class mothers generally worked and the U.S. lacked national legislation prohibiting the employment of women after childbirth, the infants of these women were thought to be especially at risk. “1884 Annual Report from the Cincinnati Health Dept.,” Annual Reports from the Cincinnati Health Dept., 614.09 qC57 v.18, the Public Library of Cincinnati and Hamilton County, Cincinnati. “1897 Annual Report from the Cincinnati Health Dept.,” pg. 39, Annual Reports from the Cincinnati Health Dept., 614.09 qC57 v.31, the Public Library of Cincinnati and Hamilton County, Cincinnati. “1911 Annual Report from the Cincinnati Health Dept.,” pg. 61, Annual Reports from the Cincinnati Health Dept., 614.09 qC57 1910-1918, the Public Library of Cincinnati and Hamilton County, Cincinnati. “Ten Years of Progress in Social Service: 1914-1924,” pgs. 4-14, Records of the Community Chest and Council of the Cincinnati Area, Pamphlets 361.97714 C734, Cincinnati Historical Society, Cincinnati. “Ten Years of Progress in Social Service: 1914-1924,” pgs. 39, Records of the Community Chest and Council of the Cincinnati Area, Pamphlets 361.97714 C734, Cincinnati Historical Society, Cincinnati. “Social Engineering in Cincinnati: A Record of Effort and Accomplishment in Promoting Personal and Community Welfare, 1919,” pgs. 25-34, Records of the Council of Social Agencies, Pamphlets 361.97714 C574so, Cincinnati Historical Society, Cincinnati. Meckel, Save the Babies, 122. In many social welfare organizations in Cincinnati such as the Fresh Air Fund and Convalescent Aid Society, the Cincinnati Anti-Tuberculosis League, Protestant Home for the Friendless and Female Guardian Society, their records showed a heightened focus on infant health above the mother, and that the physician was the one in charge of everyone’s health. The records showcase the transition from a communal, familial tradition of health and medicine to one in which the physician was the sole authority. “History and Constitution of the Maternity Society of the Protestant Episcopal Church of Cincinnati, Ohio, 1946,” Records of the Maternity Society of the Protestant Episcopal Church of Cincinnati, Box Maternity Society of the Protestant Episcopal Church (Cincinnati, Ohio) Constitution, By Laws, History, Rooster, F362.8283 M425c, Cincinnati Historical Society, Cincinnati. “15th Annual report of the Maternity Society of the Protestant Episcopal Church of Cincinnati, Ohio,” pg. 12, Records of the Maternity Society of the Protestant Episcopal Church of Cincinnati, Public Library of Cincinnati and Hamilton County, Cincinnati. “15th Annual report of the Maternity Society,” pg. 13. “14th Annual report of the Maternity Society of the Protestant Episcopal Church of Cincinnati, Ohio,” pg. 17, Records of the Maternity Society of the Protestant Episcopal Church of Cincinnati, Public Library of Cincinnati and Hamilton County, Cincinnati. “Secretary’s Report, 1897,” Records of the Maternity Society of the Protestant Episcopal Church of Cincinnati, Box Maternity Society of the Protestant Episcopal Church (Cincinnati, Ohio) Constitution, By Laws, History, Rooster, F362.8283 M425c, Cincinnati Historical Society, Cincinnati. “Pamphlets,” Records of the Babies’ Milk Fund Association, Box f362.8283 B112fi, Cincinnati Historical Society, Cincinnati. King, The Cincinnati Obstetrical and Gynecological Society, 46-48. Dr. Ernst Gustav Zinke established an outpatient maternity department in Deaconess Hospital in Cincinnati. He was the chair of obstetrics at the Medical College of Ohio, a professor of obstetrics at the College of Medicine at the University of Cincinnati and went on to be the president of the American Association of Obstetricians and Gynecologists. He pugnaciously believed that women needed to deliver in hospitals. Zinke, The Out-Door Obstetric Clinic of the Medical College of Ohio, 122. “1955 Pamphlet for the Maternity Society of the Protestant Episcopal Church of Cincinnati, Ohio, 1946,” Records of the Maternity Society of the Protestant Episcopal Church of Cincinnati, Box Maternity Society of the Protestant Episcopal Church (Cincinnati, Ohio) Constitution, By Laws, History, Rooster, F362.8283 M425c, Cincinnati Historical Society, Cincinnati. “1885 Annual Report,” Records of the Cincinnati Society for the Welfare of the Blind, Box General f362.41 C574a, Cincinnati Historical Society, Cincinnati. “Pamphlets, 1911,” pg. 6, Records of the Cincinnati Society for the Welfare of the Blind, Box Pamphlets 362.41 C574, Cincinnati Historical Society, Cincinnati. “1912 Annual Report,” pgs. 4-11, Records of the Cincinnati Society for the Welfare of the Blind, Box General 362.41 C574w, Cincinnati Historical Society, Cincinnati. “1913 Annual Report,” pgs. 7-13, Records of the Cincinnati Society for the Welfare of the Blind, Box General 362.41 C574w, Cincinnati Historical Society, Cincinnati.